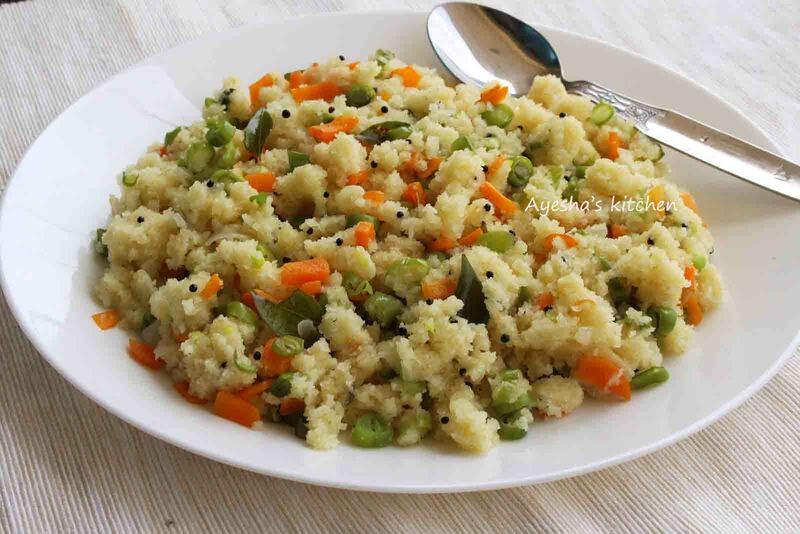 Upma / Uppumavu is a South Indian breakfast dish which is commonly made using dry roasted semolina. According to the personal preference, vegetables are added for seasoning this yummy breakfast recipe. Sometimes even shredded chicken or meat is added for additional flavorings. There are lots of variations in Upma recipe. Rice upma, Dalia upma, Idli upma, Bread upma, vermicelli upma are some common variations in upma recipes. As this healthy Indian breakfast is very quick and easy to make, most of us prefer this dish for breakfast. Here is the recipe showing how to make semolina upma /rava upma / healthy breakfast ideas /quick breakfast. Heat ghee/oil in a wide bottomed vessel and splutter mustard seeds. When done, add curry leaves. To this add sliced onion, ginger, green chilies and saute for a while. Once it is done, add the diced carrot and french beans. Saute until the vegetables are done. Add some salt. ( Be careful while adding salt to upma ). When vegetables are done, add two cups of water. And cover it with a lid until it gets boiled. Once boiled, reduce the flame to medium low. Check for salt if required. Now add the roasted semolina or rava little by little, stirring continuously. Mix well quickly to avoid lumps. (You can dry roast the normal semolina for few minutes over a medium low flame instead of using roasted semolina). Close the lid and allow the semolina mixture to cook in low flame until all the water is evaporated. Switch off the flame, once the Rava / upma is well cooked, soft and thick. Stir well again and can drizzle little fresh ghee on the top for a nice aroma and flavor. This is optional. Serve hot with a papad or pickle or chana masala.